How many online accounts you have? If you are like an average American, you should have more than 20 online accounts. Starting from Gmail, yahoo, Skype, Whatsapp, Facebook, twitter to important financial account like checking, broker. And, if you’re a savvy internet user, you must have accounts with your utility providers. and if you’re like 80% of rest of us, you probably have same password, with a little variation, for most of these accounts. The reason, it’s so difficult to remember passwords. And you know that writing them down somewhere is riskier. But, having same password across different accounts is risky as well. If you password is stolen, for example, your local library, thieves easily can crack open your checking banks. More dangerous it is when you let your browser remember your passwords. So, if your laptop or smart phone is stolen. Your identity and financial assets can stolen with relative ease. Let’s talk about how to safeguard yourself, how to protect your password. Let’s talk about password managers. Password managers are a database of your accounts and your password. After purchase and installation, password managers sits on your computer browser or smart phone. When required, they will key in the password for you. Then will activate themselves when a new account is accessed, to store the new password. Password managers are secure, they required keying in of the master password to begin service. For smart phone many managers employ fingerprinting security. So, if you lose your phone/computer, your data and money will be safe. There are many password managers out there. Some are free, some are really costly. And some are very affordable. We won’t talk about free ones. I don’t use a free password manager and won’t recommend them to you for obvious reasons. Let’s not compromise on security! I liked this one best, being a user. This is a new password manager that was launched in 2012. It has taken advantage of the flaws of other password managers and improved on them. For instance, it has a very crisp and easy to use interface. It is easy to auto login or fill forms automatically using this password manager. Something else is that it supports four -two author authentication for better security. Sharing of passwords with authorized persons is allowed in Dashlane. It only takes a few clicks to change multiple passwords when using Dash lane password manager. Certainly, this feature has made it have a huge subscription here in the U.S and the world in general. Another amazing feature of this password manager is that it has an inbuilt password changer that allows it to protect your account whenever a suspected hacker is detected. If anything, it also notifies you for any suspicious login And although it can auto change your passwords, you have the full control of them. You can change any password at any time you wish to. I am sure if you like online shopping, you are aware of the risks involved. However, Dash lane has digital wallet features and purchase tracking to give you extra safety even when purchasing at retailers whose accounts you have not. Alongside these features is that Dash lane can store your data locally in a vault that is safely encrypted and only you have the password to it. You can also synchronize your passwords online if you wish to. Dash lane premium costs $40 a year and supports Windows, OS X, iOS, Mozilla Firefox, Internet explorer and Safari. This password manager is simply unbelievable. First, it has a great user interface that is not only easy to use but it is also very safe. It allows you to store your passwords online or synchronise them with other electronic devices. With Last pass, auditing your passwords can never be easier. In addition, it allows you to automatically change the passwords whenever you wish to. Lastly, this password manager allows you to authenticate your passwords using Google’s authentication manager. Following their recent update of the system, this password manager now allows credit monitoring, document storage and securing your passwords. And it does not just end there. Last pass will immediately notify you whenever someone tries to hack your accounts. It also has tools you can use to fill forms automatically and streamline all your online shopping. Last pass is greatly revered worldwide and one reason why, is that it supports all types of operating systems. It supports Windows, OS X, Linux, Android, iOS, Blackberry phones and windows phones. With the premium subscription costing $12/ year, you can imagine the benefits you would have by purchasing it. This is the best password manager for local use without synchronizing your passwords to the web. It uses a very strong password generator to assist you change your passwords whenever you wish to. Moreover, it is very versatile and fast when used in almost any web browser . If you want to secure your notes for other passwords, this is the manager to use. Also notice that 1 password manager can set up emergency contacts for you and with it, you can seemingly share your passwords with an authorized person. Alongside these features, this password manager supports windows, OS X, Android and iOS, with Google chrome plugins, Mozilla, Opera Mini and Safari. For a premium price of $50, you can enjoy safety for your passwords wherever you may be. It also supports all windows devices. Price varies between windows, iOS and Mac operating systems. 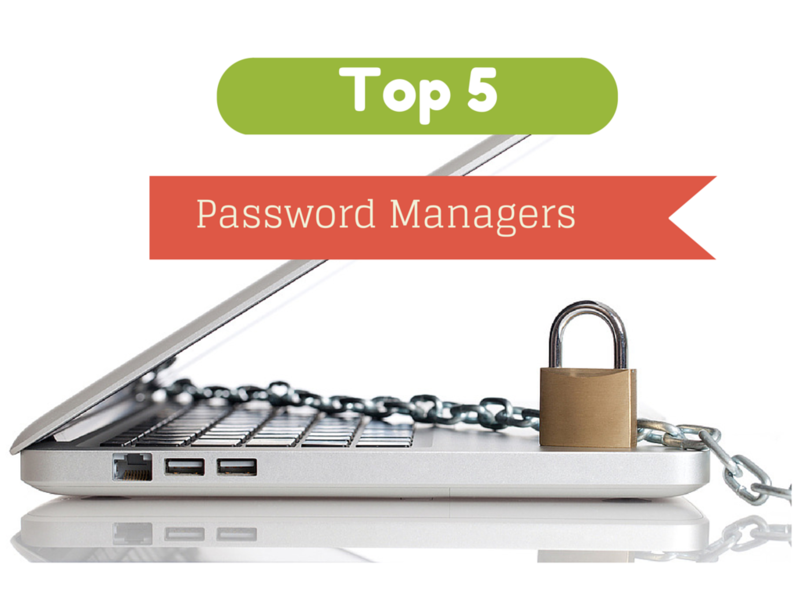 This password manager completes the list of our fantastic 5. It is among the first of its kind since it was launched in 1999. It is among the best solutions for filling your web forms automatically with different addresses. With this manager, you have the option of keeping your data locally or synchronizing them to the websites across all your devices. Robo forms has one of the greatest user interface that enables you to bookmark your favorite records. It supports Windows, OS X, Linux, Android, iOS with plugins from Google chrome, Firefox, Opera mini and Safari. Furthermore, it only costs $20 a year, but for the first one year, you only pay $10. I only mentioned this as one of my close friends is using it and he’s quiet satisfied. This is among the most used password managers in the world. It is easy to know why. First, you can access all your passwords in an encrypted database. It is a device to device password manager and never uploaded to the Internet . What makes it outstanding is the fact that it is very portable and can be used on different machines with ease. Like in most topnotch password managers, it has its own password generator that helps you change passwords easily. Actually, your passwords’ database can be configured with many unique keys, hence allowing you to share them with people you authorize. I’ve used LastPass and have been happy with the performance. You still need to make sure your passwords follow guidelines and you should still change them periodically. I was watching 60 Minutes last night and saw a story about a major oil company that forgot to change the default userid and password on their network servers, a security company was able to penetrate their server with little effort and could have done major damage. The first step is to change the default userid and password to something much more secure. But being a individual, should we be worried about default user IDs? If you mean WordPress default IDS for bloggers then I took care of it by deleting the default ID. Changing password periodically is a good practice, especially for the financial accounts. I believe 1Password is a one-time fee (the current heading says $49.99 per year).